Another thundering set by our Belgian power trio, back home, at the AB, following the release of their "All This Dancin' Around" LP. In front of a packed supporting crowd, our shooters are on top form. Ruben's voice and guitar are still stunningly extensive, Mario's solo just before "Little Teaser" is one of the most devastating one I've heard from him and Monsieur Paul's bass sounds as well, particularly heavy here ! So does the performance of "My Baby's Got A Gun" when, after the sweet bluesy start, a pulsating electricity blitzkrieg falls upon you !! As the end of the concert closes in on the moving Ray Charles's cover from the album, I've tried to keep up the magic with a "covers corner" in which Ruben's voice turns the various-era songs into gold classics, provided they were not yet so. Particularly impressive on Dylan's "Ballad Of A Thin Man", lavishly delivered in an incarnate version by Ruben The Voice. Thrills ahead ! 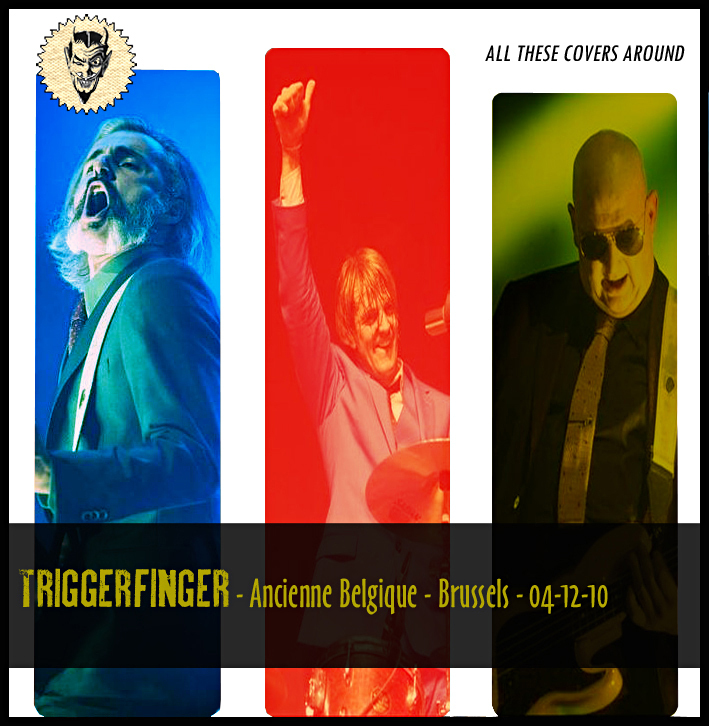 Triggerfinger has always been terrific on covers (which shows well their openmindedness - see also their chart n°1 cover of Lykke Li's "I Follow Rivers'). Here, their second cover of Rihanna is again no exception. The video quality is lower than the other ones but I've chosen to keep it as I haven't found any other pro-shot video of the song. It is comfortably watchable nonetheless and the performance, with his Led Zep's Kashmir intro, is awesome (as you can hear it coming from the audience) ! Well ... this is really weird ! Was the file corrupt or did FF tell you it's unavailable ? For my part, I could grab it ! I'm getting closer to the time to renew my subscription to Filefactory and I'm really wondering if I will ! Why pay more to have less ?!! As for Triggerfinger in Nantes, Le Zenith, I have a few others (Muenster, Machine Du Moulin Rouge - Paris, Garorock - Marmandes, Plymouth, Liège, Angoulême, ...) but don't have this one BUT I think I can get my hands on it quite easily. As for the other concerts you have: you would make me very happy when I could dl them (audio is enough for me, just a flac file would be fine). Can you manage that? And... sure hope you can grap Nantes as well! Yep, this is really weird indeed ! I've just downloaded parts 2 and 3 without a hitch !!?? As you mentioned it, must be something to do with the difference they make between free and registered users maybe. Not fair !! Giving this, I think the best thing to do now is to go back to the vintage but effective torrent tracker solution ! I'm dealing with it right now and put it on Zomb just after so that you can, at last, get your hands on it !! I'll see what I can do for the gig in Nantes and will let you know about it. I'm off for a few days. I'll see what I can do when I'm back ! I'm back home. Well, I think "uTorrent" is just a client that allows you to download from torrent sites. I would rather keep away from those that are meant other than to music and actually, I don't really know how to proceed (vintage too, you know ! ;-)) - I will try to upload the AB concert on Mixture Cloud in the following days. I think I still have some room left. Need to check ! 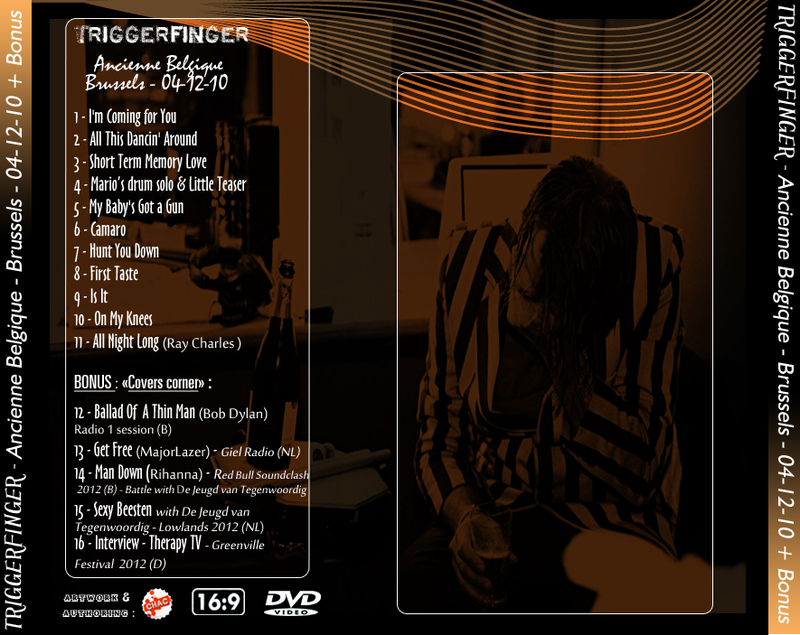 Or, maybe the quickest way, you PM me with you address in Belgium and I send you this "bloody cursed" dvd :-) ! An English Thermals fan did that to me last year. No bother ! I'll let you know about the other stuff. Still haven't got the Nantes gig yet ! Many thanks for the efforts... I got the AB concert + bonus now from Zomb, so, no need for this anymore! Glad you could finally get your hands on the AB concert. I'd started to upload it to Mixture Cloud but it took ages and I came across many errors. So, everything's fine, now ! Well, ... almost ;-) ! I don't know what's going wrong with the Rockpalast gig. I haven't downloaded the .rar files myself to check it again (I may do it in the next days) but if you want, I can try to upload it to Zomb if, like you did for the AB's, you still have the opportunity to grab it ? Let me know about it. In the meantime, may the "triggerforce" be you ! Yeah! This time all went well! Many many thanks... you've made my day (week, month even year!). Now I have them all you posted here... so, the other treasures you have, how can I get them? Are they video's to or just audio(you know that's enough for me)? And, any news about the Nantes gig?